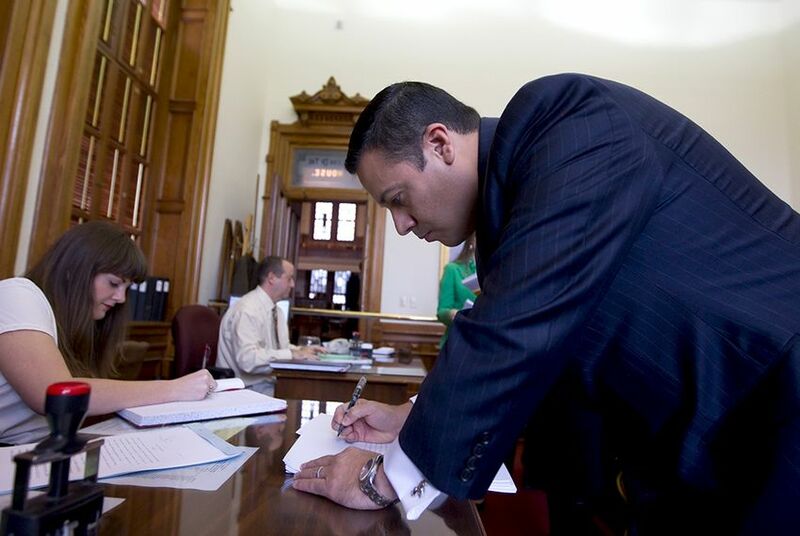 State Rep. Jason Villalba, R-Dallas, said Friday he will propose legislation to eliminate "conscientious exemptions" because of the re-emergence of diseases like measles attributed to growing numbers of parents choosing not to vaccinate their children. State Rep. Jason Villalba, R-Dallas, said Friday he will soon propose legislation to eliminate what are called "conscientious exemptions" because of the re-emergence of diseases like measles and whooping cough attributed to growing numbers of parents choosing not to vaccinate their children. "We are just saying, 'Look, if you are going to send your children to public schools, they need to be vaccinated,'" he said. "We are going to ask that you keep other children safe." The measure, which Villalba said he would file next week, comes as several other states are re-evaluating their immunization laws as they battle a measles outbreak linked with exposure to an unvaccinated woman in a California amusement park. Under Villalba's proposal, Texas would not allow an exemption for either of those reasons. Students would still be able to receive medical waivers, which doctors grant in cases where an allergic reaction or a weakened immune system could cause health complications. There are signs that such legislation might encounter opposition from other lawmakers, including state Sen. Charles Schwertner, the Georgetown Republican who chairs the Senate Health and Human Services Committee. Tom Holloway, Schwertner's chief of staff, sent the following statement to the Tribune Friday afternoon: "Vaccines are responsible for saving countless lives over the last century, and as a practicing physician, Senator Schwertner believes that immunization represents a critical component of protecting the public health. At the same time, the Senator would prefer to increase education about the safety of these vaccines rather than imposing new mandates that would ask Texas parents to act against their own conscience or their deeply-held religious beliefs." The state broadened the grounds that could be used to waive vaccine requirements in 2003, when lawmakers expanded an existing religious exemption that applied only to members of a "recognized church or religious denomination" to include any philosophical or personal objections. The Texas Tribune reported Thursday that more than 38,000 students — about 0.75 percent of the state's overall school-age population — had non-medical exemptions to school immunization laws statewide in the 2013-14 school year, according to Texas Department of State Health Services data. That figure, which includes students at both public and accredited private schools, has soared from just under 3,000 — or 0.09 percent — in 2004. State law requires that children at all public and private schools have 10 different immunizations, including for tetanus, measles and pertussis, the bacterial disease known as whooping cough. Generally, those vaccines must happen by the time students are in kindergarten, though others, like for hepatitis B, occur in later grades. To opt out of those requirements, parents sign an affidavit confirming they understand the risks of not vaccinating and that their child could be excluded from school in the event of an epidemic or public health emergency. Texas had a measles outbreak in 2013, when more than 20 people contracted the disease in the Dallas-Fort Worth area. The cases were traced to the Eagle Mountain International Church, which is led by pastors who express skepticism about vaccines. A man who had been infected with the disease in Indonesia had recently visited the megachurch.